I am a fan of giving each holiday it’s due, but things happen fast in the fall. So, as I have done for the past five years, it is time. Halloween is almost on us, Thanksgiving follows quickly, and before we know it, Christmas is upon us. That can mean only one thing: Time for your Christmas card session! This is usually a fun time of year for me where photography is concerned. Everyone has unique ideas for what they want for their Christmas card. Some want a traditional family photo. Many want something with a little bit more story to it. There are even a few who are less interested in creating a Christmas card and more interested in creating a piece of art for their significant other’s eyes only. Whatever your preference, creating a quality card takes times. There is a lot of planning and scheming involved with making your card unique. We have to find the right time and place to make it happen. Once the photographs are taken, the creation of the actual card begins. There are usually a few standout images that need to be worked up for an artistic canvas or metal print for someone’s wall. The slowest part of all is finalizing the card and ordering the prints. This is why I usually set a deadline in early December. Let’s get things done and the cards in your hands in time for delivery to your friends and family! Given the amount of customization involved in creating a bundle of Christmas cards, not to mention the material costs, this is surprisingly affordable. I could (and probably should) charge considerably more than I do, but this is a fun, creative exercise every time. Including premium envelopes with your address already imprinted on each one, pricing starts at $7 per card! Go ahead. 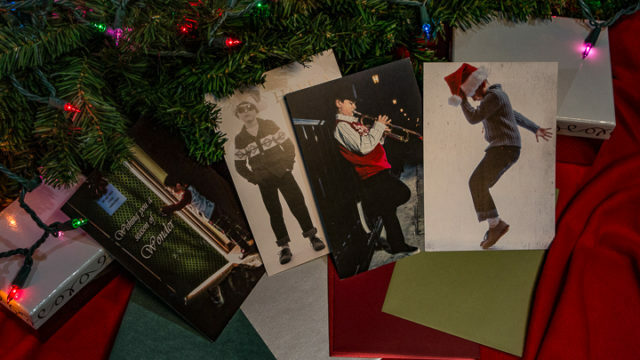 Check the holiday card shelves for a quality card that has your custom image on it! Sold in packs of 25 cards each, the more you need, the more competitive every card becomes. Are you ready to have your own, custom Christmas cards made with Mark Gunter Photography? Then it is time to contact me before time runs out! And don’t forget to ask about other print options like canvas, metal, and prints while you’re at it!